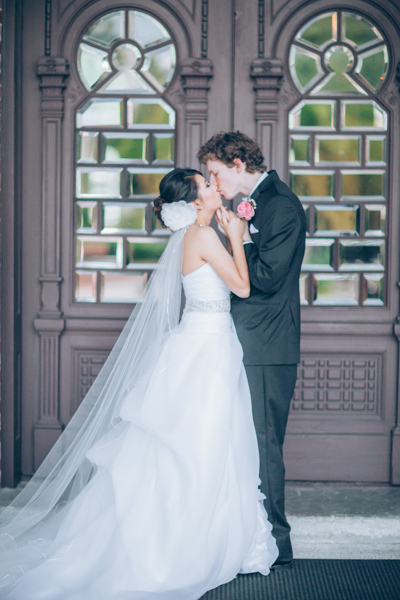 We got a little misty-eyed when viewing Anh and Scott’s wedding images for the first time. 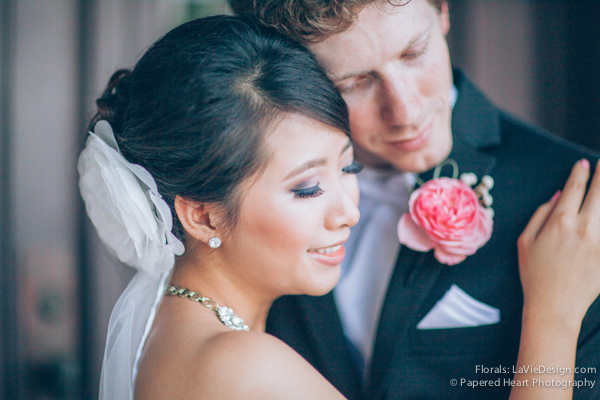 The ceremony and reception were beautiful in person, but the images taken are so charming and heart-felt, that they have captured our hearts. 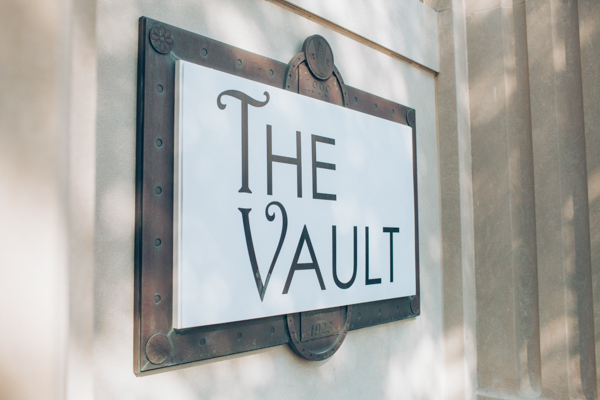 The Vault is one of downtown Tampa’s historical treasures. What was once The Exchange National Bank, this venue offers versatile surroundings that allowed Anh and Scott to host their ceremony and reception in one location. The results were outstanding. 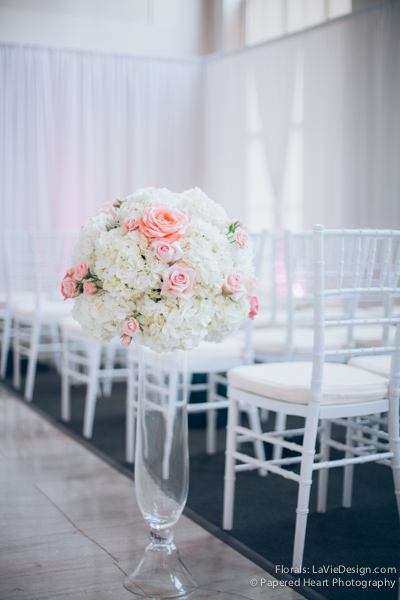 The entire main atrium was decked with soft, white drape, while the lighting surrounded the 30-foot ceilings and transformed the room. While the guests were ushered into the garden fountain area for cocktails, the room was transformed again into the reception hall. Stunning! Take a look! 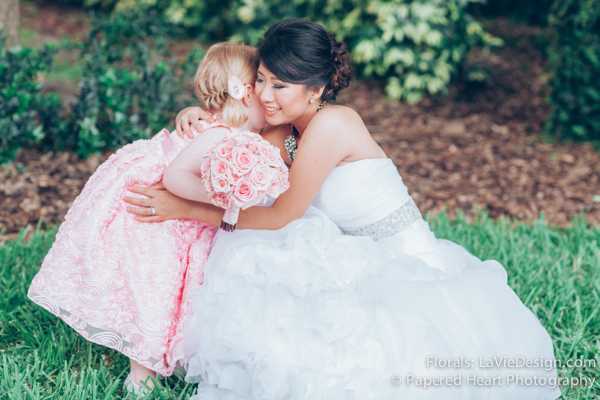 Special thanks to Papered Heart photography for these wonderful images. 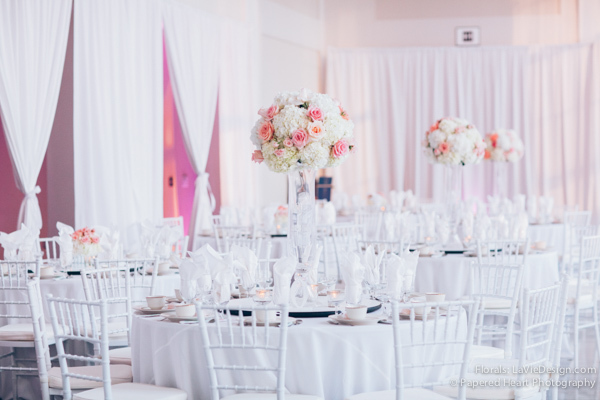 All lighting, drape, flowers, decor and linen provided by La Vie en Rose. 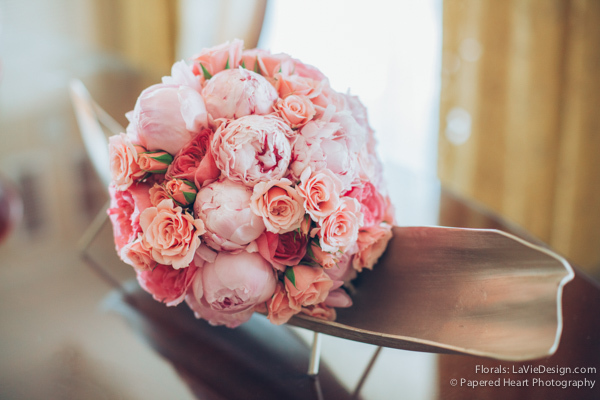 Anh requested an all-pink bouquet of different shades, and these peonies added a soft and romantic touch with the garden roses and spray roses to complete the look. Ceremony arrangements were formal yet fanciful. 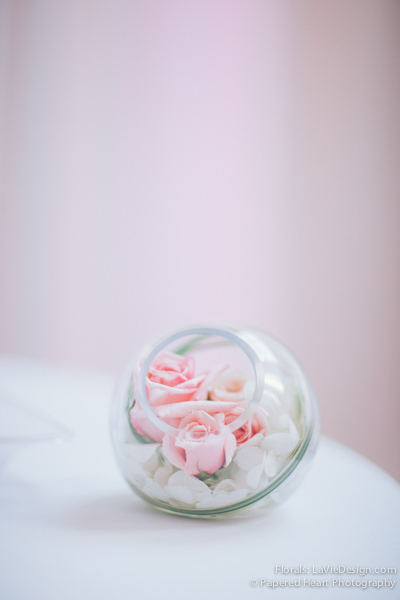 The overall shape was clean, with the voluptuous pink rose blooms adding whimsical symmetry. The bride enters, glowing with excitement: this is the first time she has seen the room that was designed just for her and her groom. 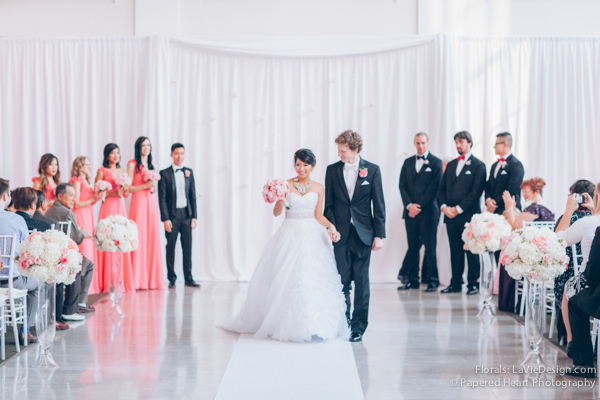 Anh and Scott said their vows in front of hanging crystals and glass orbs filled with rose petals. Now husband and wife, let the fun begin! 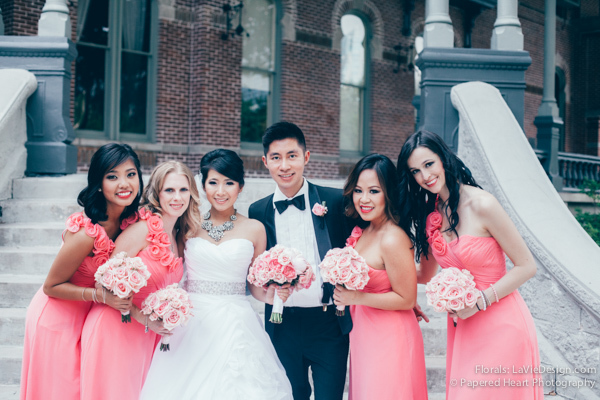 Bridesmaid bouquets were monochromatic roses, and boutonnieres were peony and brunia. 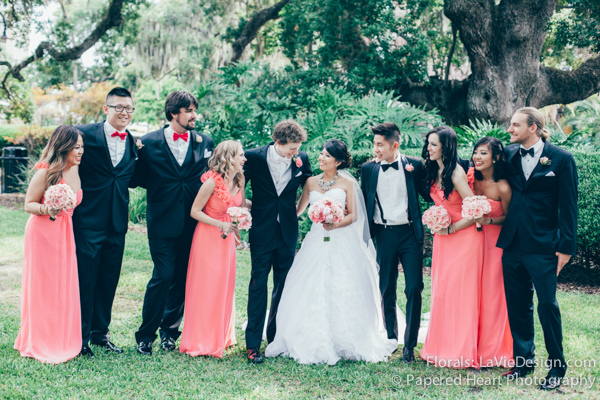 The bride and her party were fun and playful while they posed for pictures at University of Tampa. Cocktail hour orbs were a small continuum of the entire ceremony. 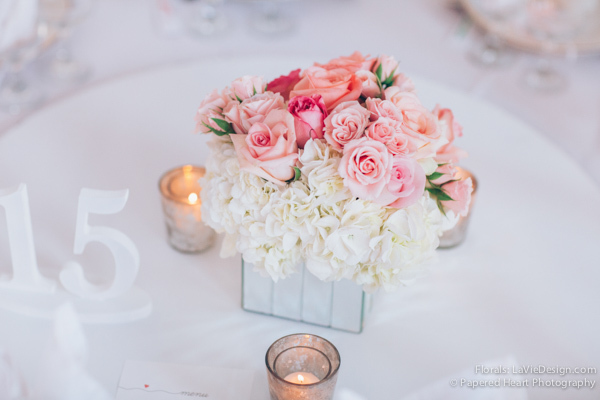 A simple, low arrangement with mercury votives were just perfect for the vibe Anh and Scott wanted to create. Sometimes it is better to allow a focus on one special piece, so the details are more noticeable. 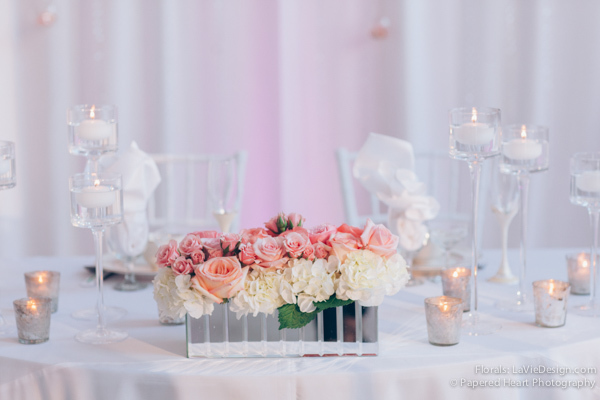 The sweetheart table…roses in perfect bloom…they almost don’t look real. 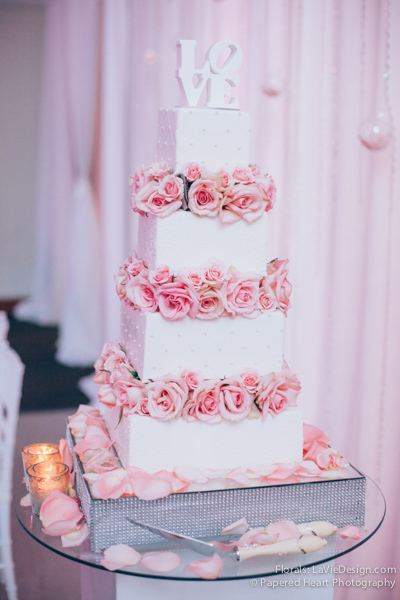 Anh wanted three tiers just loaded with rose blooms, so we made it happen! The results are so pretty…we just want to eat them! A time for secrets in the secret garden. How picturesque! 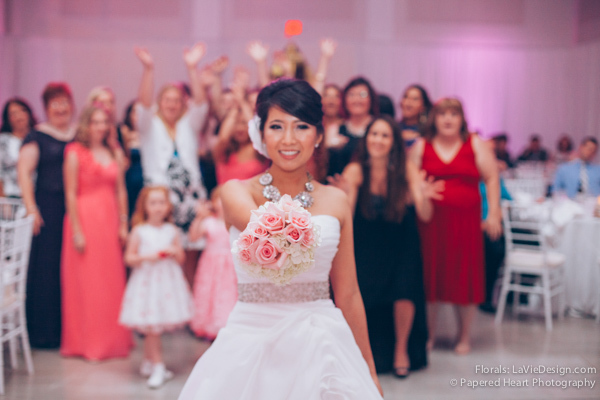 The toss bouquet was gorgeous enough to be a bride’s maid bouquet. Whomever caught this one was a lucky lady! 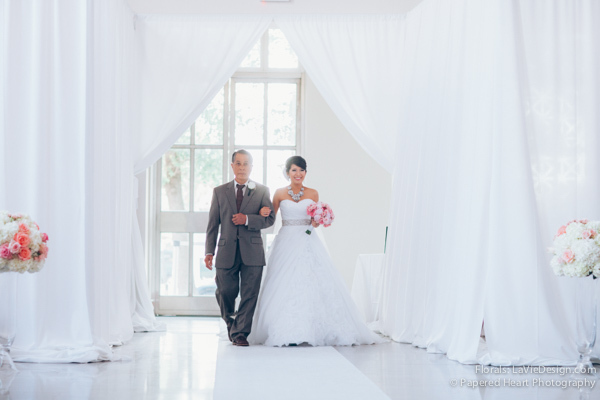 Anh looks ravishing here in her reception gown. 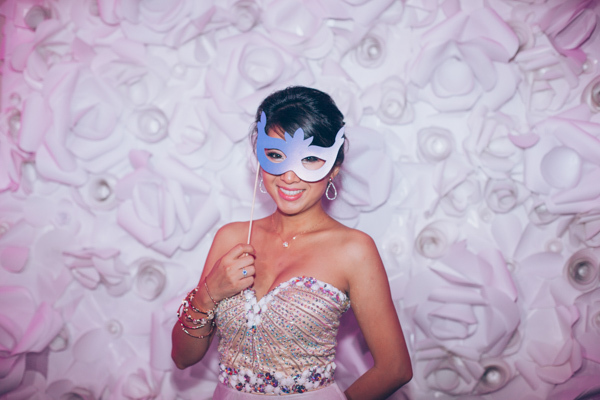 The Vault has an art gallery, where the reception “photo booth” took place! 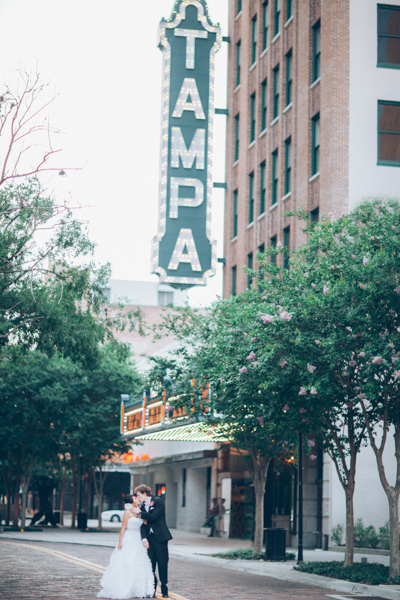 Downtown Tampa has so many great photo spots! Here they are in front of Tampa Theater!